The Italian minister of interior, Matteo Salvivi of the fascist Lega party tweeted that he did well “to block NGO ships”. Published by Enough is Enough. Written by Riot Turtle. Image above: Aquarius in the Central Mediterranean, September 2018. Image by Maud Veith/SOS Méditerranee. Italian authorities seem not be able to proof their charges of “illegal human trafficing.” The order to seize the Aquarius is officially motivated because of alleged anomalies in its disposal of on-board waste. Once more the fascist Italian government uses false pretenses to stop people from saving people lifes. “After two years of defamatory and unfounded allegations of collusion with human traffickers, judicial investigations, and bureaucratic obstacles against our humanitarian work, we are now accused of organised crime aimed at illicit waste trafficking. 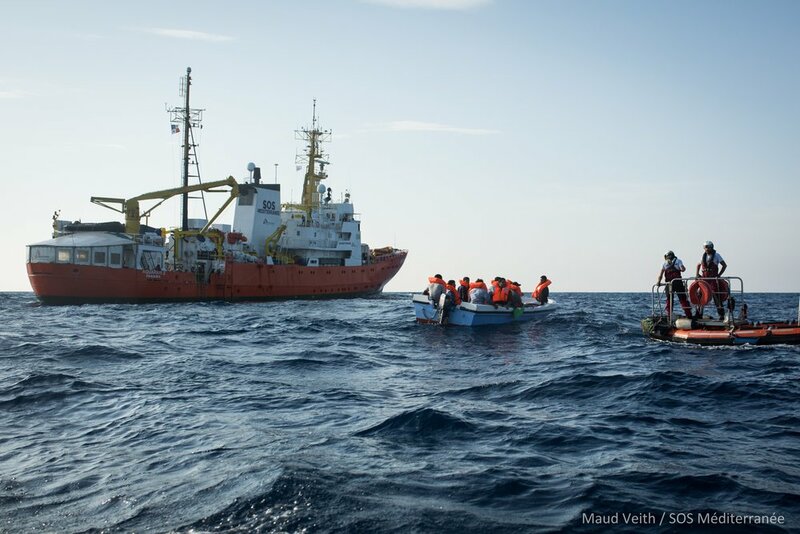 This latest attempt by the Italian authorities to stop humanitarian lifesaving search and rescue capacity at any cost is sinister,” says Karline Kleijer, MSF’s Head of Emergencies. “Two years of smear campaigns against search and rescue activities, baseless public accusations of criminal activity, and the closure of places of safety have impeded humanitarian aid and discouraged ships of all kinds from rescuing boats in distress on the Mediterranean Sea. The ultimate result is a surge in human suffering, as the European-funded Libyan coast guard returns more and more survivors intercepted in international waters and sends them back to arbitrary detention in Libya, in contravention to international law” continues Kleijer. The fight against EU border policies is growing in Europe, but a lot of protests appeal to governements that are increasingly authoritarian and right wing. Some of these governments are coalition governments with far right parties like Lega (Italy), FPOE (Austria) or Fidesz which is even governing Hungary alone. If we want to end the drownings, the suffering at the EU borders and the freedom of movement for all people, we have to abolish these borders. On December 10 there is a transnational day of action for a world without borders. Previous post: #ClimateJustice #Amsterdam #Netherlands: Two years #CodeRood: And now?